Watch full Naruto Shippuden Season 20 Episode 1 English Dubbed full HD online. Naruto Shippuden Episode 414 English Dubbed online for free in HD. After Naruto loses Kurama to Madara, Sakura attempts to save him while Gaara transports them to Minato in order to have Yin-Kurama sealed into Naruto to save him. As Sakura learned her medical ninjutsu is unable to reverse the effects of Kurama’s extraction, she resorts to slicing open Naruto’s chest and manually pumping his heart. Meanwhile, a distraught Karin is being kept from healing Sasuke by Tobi using a miniature version of Hashirama’s Wood Style: Several Thousand Hands. Though Karin attempts to counter with her Adamantine Attacking Chains, Tobi impales her with a wooden staff that shoots out several branches. But Karin bites her arm and heals herself as Suigetsu then comes to her aid with his Water Gun: Two Guns. Though Tobi manages to dodge Jugo’s attempt to grab him, he is immobilized by Orochimaru placing his curse-mark on the White Zetsu. Karin then resumes running Sasuke as she senses an ominous chakra at his location after Madara left him to die. Meanwhile, Madara absorbs the restored Ten-Tails to become its jinchuriki before making his way towards Obito to reclaim his remaining eye. 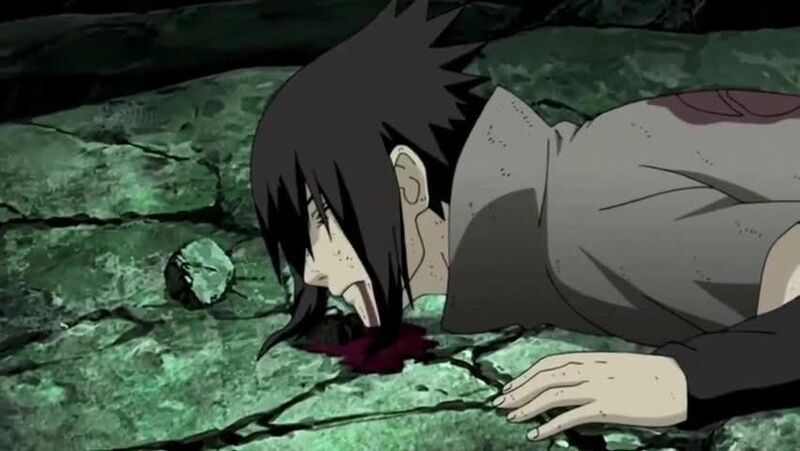 Along the way, Madara pauses for a moment to spit out the Benihisago and Kohaku no JÅhei from his mouth, which lands on Lee and Guy as they are retreating with Tenten. As Minato and Kakashi prepare to force Black Zetsu off Obito, Yin-Kurama alerts Minato to Gaara and Sakura’s arrival. After learning the situation, Minato decides to transfer Yin-Kurama into Naruto while Gaara helps Kakashi in holding off Black Zetsu. But the transference is intercepted by Black Zetsu as he absorbs the Nine-Tails chakra.